We’re less than one week into round 4 of #SciFund, and we have our first member of the 100% club, with Laura Deighan’s project, “How can NGOs guide fisheries to ecological sustainability?” crossing the line in about 4 days! 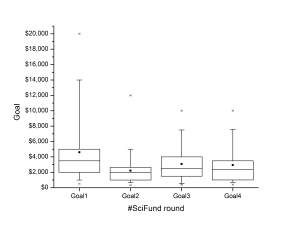 Something that is interesting, though, is that the funding goals have stabilized after the first couple of rounds, with 3 and 4 showing an almost identical pattern of targets. 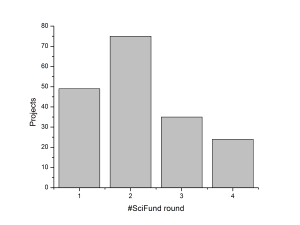 This may be that after the first round, where there was really no data or expectations of what was achievable, researchers have zoomed in on what is a realistic goal for science crowdfunding for right now. There are 23 other #SciFund projects that need your help! You should go to Experiment now and find and fund your favourite!